Making headlines: Was Göbekli Tepe built by Aboriginal Australians? Most astonishing news are spreading these days again. An article published November 14th in Epoch Times [external link] was claiming a truly amazing discovery already in it’s headline: “Australian Aboriginal symbols found on mysterious 12,000-year-old-pillar in Turkey”. Since then these news were repeatedly picked up and reproduced, and meanwhile we received many requests by interested readers here, asking if this was true. This unusual hypothesis was based on superficial similarities between selected images and symbols occurring in both cultural contexts (Anatolian Pre-Pottery Neolithic Göbekli Tepe and Aboriginal Australia). Aboriginal signs and symbols apparently painted onto a medicine man’s chest or carved into stones are paralleled with reliefs on Göbekli Tepe’s pillars or other objects known from this and contemporary sites of the region. Before having a closer look into these assumed analogies, a few general remarks should be noted. According to latest research, the Australian continent most likely was settled about 65,000 years ago (cf. Clarkson et al. 2017), probably via the Malay archipelago. So, both cultures were contemporary at some point? Yes, but in different parts of the world – with an ocean between them. And with an incredibly long period of isolation in case of the Australians (Bergström 2016). This obvious chronological gap and the huge geographical distance of about 15,000 km would make a direct relation and interaction of both cultural phenomena rather difficult. On the other hand the key evidence, the Aboriginal elder’s chest symbol, is of a much younger date. The referenced depiction seems to be the reproduction of a photograph from the late 19th / early 20th century Spencer and Gillen anthropological expeditions through the continent (further information and resources on the website of the “Reconstruction the Spencer and Gillen Collection Project”: [external link]). The original photograph was first published in 1904 (Spencer & Gillen 1904, 58 Fig. 33) – significantly later, about circa 12,000 years later to be precise, than the Göbekli Tepe pillar was carved. Again quite a distance. Yet the rather recent study of Aboriginal symbolism at least allows us to understand the icon in question here, describing two persons communicating. However, the supposed analogy at Göbekli Tepe is (at least in this combination) a much rarer exception in early Neolithic iconography – one of which we cannot say what it actually meant to the prehistoric people carving it, due to a lack of any related sources. Besides, and that might be the strongest point to highlight here: the Göbekli Tepe symbol does not at all look exactly the same. In fact, upon closer inspection it appears quite different (cf. Fig. 2): what appears to be a straight horizontal line in the Aboriginal sign is more of an “H”-shaped icon on the T-Pillar – with two vertical ‘arms’ at each side (which are obviously missing in the Australian example). The same has to be said about the other symbols mentioned and in particular the female figure from Göbekli Tepe’s so-called Lion’s Pillar Building which is linked to Aboriginal depictions of the Rainbow Serpent, going by the name of Yingarna – sometimes depicted as a women in some Aboriginal cultures. Again, we know context and meaning of one of these (the Australian example), but do not have any further sources for the other one at Göbekli Tepe – which, by the way, was not part of the original decoration, but is a later added (and again exceptional) graffito. These already dubious analogies are further complicated by assumptions aiming to underline the argument, but lacking a clear factual basis. Substantiating that the Göbekli Tepe pillar symbols must be “similarly sacred” since the “pillar depicts a deity” is of course highly interesting, but not without problems as already discussed earlier. And the assertion that the enclosures at Göbekli Tepe were “… created by a society that was wiped out by a cataclysmic event”, referring to a recently published study causing a similar news output, did not go without criticism too. In the end, an all too simple identification of similarly appearing symbols and equation of the complex individual cultural phenomena behind them, would be highly speculative – and is doing injustice to both cultures and their rich iconography. Furthermore, the focus on only a few selected images and symbols in an otherwise rich (and diverse) iconographic repertoire seems arbitrary. There are many more differences to be noted between these two cultures and places than actual similarities. Additionally, Aboriginal Australians are not at all forming one single homogenous culture complex. More than 400 distinct Australian Aboriginal peoples could have been identified meanwhile, distinct groups with an own language (including a specific symbolic language) and peculiar culture (Horton 1994). Horton, D., The Encyclopedia of Aboriginal Australia: Aboriginal and Torres Strait Islander History, Society, and Culture, Canberra 1994. #FactCheck: It’s on the internet, so it must be true. Right? Thanks a lot for your kind comment. Very much appreciated! The article in Epoch Times showed a boar on the head of the pillar, omitting its number, 28, omitting the ‘I’ at the bottom, and omitting the ‘H’, as you correctly showed, which is a significant difference. You, on the other hand, omitted the boar at the head. One can not hope to correctly identify the symbolisms by focusing on a single detail that fits in the supposed solution, while silently ignoring all the others that do not fit. It is like showing a printed word with some of the letters obscured, which allows for various interpretations. The pillar should be interpreted in its entirety, and this one is the analogue of the Pillar 33, from Enclosure D.
May I ask if there is a giggling Fox too on the invisible, left side of Pillar 28 ? The Epoch Times says that there is only one female figure on GT (similar to the aboriginal Yingarna), the one that you showed, but the said Fox on the pillar 33 is a female too! Pay attention to details. There are few others, those that you have yet to detect. Yes, there is a boar depicted in the upper part of this pillar. As on many other pillars in this peculiar enclosure (Enclosure C). But since the point of this contribution actually was not an overall interpretation of iconography at Göbekli Tepe, I freely admit I did not elaborate on this one. I was not focussing on a single detail here (in fact there’s plenty of discussion on the blog (and elsewhere) about PPN iconography), since I actually was trying to show that the symbol in question does in fact not look like stated in the article. There’s no fox on P28 visible yet, giggling or not. And I honestly think we would be wrong in our job if we weren’t paying attention to details. I was (politely) referring to the anatomic detail that identifies the *Fox on Pillar 33 as female*, contrary to the Fox on Pillar 18 and elsewhere which are males. By saying that, I was supporting you by additionally debunking the article which stated that there is only one female depicted on GT. By saying that one has to look the entire picture, I was also supporting your refutation, since they did not include all parts of the image (the letter ‘H’ became ‘-‘), and thus you were correct, and they were wrong. Thanks for the answer on the Fox. Great job, Jens. It is sad to have to respond and debunk every simple and often outlandish explanation for this truly amazing find. You are doing a great job of revealing enigmatic artifacts that will need careful and detailed study to uncover their true meanings and origins. People need to understand that this cannot possibly happen overnight and may in fact never be truly revealed. My hat is off to you, sir. Keep up the good work. Thanks for your encouraging comment, too. It’s good to see that our attempts to inform about latest research and to clarify such misunderstanding as this example here are really finding readers. Very encouraging indeed. Thank you. Jens, might the figure on Pillar 28 be a different configuration of the pictograms “C” and “H” on the belt of one of the central pillars of Enclosure D? These “letter” pictograms also appear at the throat of that pillar. I note that there is also an inverted “H” at the base of Pillar 28. Are there other instances where these pictograms appear in association with each other? this seems absolutely possible. There seem to be several variations of the “C”- and “H”-like symbols repeatedly appearing in the site’s iconography. While they of course cannot be really associated with the corresponding Latin letters, they certainly may carry peculiar meaning in the contexts they are displayed. We are currently looking into this question in the course of ongoing research. Thanks, Jens, keep it up. It seems to me there are two misunderstandings here. (1) that the “symbols” are not the same, and (2) That the “symbols” were brought from Australia to Gobkli Tepe. (1) Appearances are deceiving. If one does not understand the ancient depicted system then one looks for what is familiar. There is, presently, a mental set against the idea of a common use of signs in ancient times. It is often stated that the signs were different between the various ancient cultures due to time and distance. But in the same breath it is admitted that the meaning of the signs is not known. If one doesn’t know the meaning of the signs then how can one make cross cultural comparisons, as well as denials, of their same or similar meaning? (2) The same “symbols” cannot only be found in Australia but also in the equally old Borneo and New Guinea Cultures, so why isn’t it assumed that these cultures built Gobekli Tepe? Of course, the same signs are also found in European caves that are over twice the age of Gobekli tepe. The differences between the Australian signs and th Gobekli Tepe signs are greater than mentioned in the quote above. The Central Bar between the “U” shaped signs is Oval in the Australian (meaning, all or everything, in the blackness/darkness) while it is Rectangular (meaning, a place) in the Gobekli Tepe signs. The “U” shaped signs have the same meaning (turning, in relative positioning, above and below). The “H” signs simply mean, connected-places, in the east and in the west (in gesture signing the Left Hand indicates the east). The same up ended “H” at the base of the Gobekli Tepe Pillar indicates,the places, positional, above and below. The Double Lines (meaning, hidden or unseen) that is part of the Pillar is also “U” shaped. The Rectangular Top of the Pillar (meaning, a place) is positional, on the side (of the Body of the Pillar) and thus means, the Vertical-place, the unseen or hidden, turning, below. Wherever found in the ancient world these signs, within their overall context, hold the same meaning and basically relate to a cosmological world view that was preserved by the signing system. Speaking for myself there is no misunderstanding here. I’m aware that the cross-cultural and cross-chronological and cross-spatial interpretation of these symbols intends to posit a somehow common origin of these cultural phenomena. Without any additional sources we need to rely on formal analogies. But the further away these parallels are found, chronologically and geographically, the more blurry a relation becomes – for the simple lack of a possible direct interaction and exchange. Assuming that all these phenomena and occurences in different parts of the world at different times are linked to each other would be an extremely diffusionist point of view – without convincing archaeological or historical evidence. Typical range of motion for an average hunter-gatherer group was estimated to 300 km, as far as I know. Just for food. They were particularly keen to travel even further away to obtain obsidian and other luxury items, for barter, which existed at that time too. Also, while men remained relatively territorial, women traveled far, for hundreds of kilometers, to merry, probably on ferstivals like those on GT. If you take such circumstances into account, one should have at no wonder that some sort of common language, gestures and signs developed throughout the then one-continent world, from GT to South America. Over the course of time the best stories, tales of travelers, were remembered and recorded, in repositories like GT. When people gather around the fire at evening to tell their tales, the best ones are not hunter-stories (for they were all hunters), but those of the long-lost past, of the YD calamity, of Ice Age, of volcanic eruptions, of conquests. The best of those were recorded there on GT. Information travel even further then people, and all the people of the world were highly mobile at that time. Australia, however, is off the chart, not on the same one-continent land, so no stories from Australia reached the GT. Those from America did, however. Mommy mommy that man called me an extreme diffusionist! I have previously stated that I am not a diffusionist (a term that seems to be a pejorative appellation in archaeology). One does not need to posit direct contact among widely disparate cultures in order to state that sign language was in use by a great many ancient cultures. It had great utility in silent hunting, silent signing used in warfare, and in trade between cultures that used different verbal languages. Once learned such an asset would not be lightly discarded. You state that “the further away these parallels are found chronologically and geographically the more blurry a relation becomes. –for simple lack of a possible direct interaction and exchange.” Further away from what? The neighboring tribe or culture? Sign language would continually be reinforced through local contacts between these signing groups. Also, you make sweeping statements as to the changes that the signs undergo even though you can not have any archaeological or historical documentation for this. The same applies to your statement about “the blurriness” caused by distance and time. Where is your documentation for this statement? Most archaeologists say they do not know the meaning of the signs so how can such assumptions be made? You and other archaeologists constantly refer to the ancient imagery as “symbols” or “iconography” both of which have limited communicational value. Thus you describe a “symbol” found on the Pillar as an “H” symbol and also view it as a unity as opposed to a compounding of sign elements. Have you read any of my background papers on ancient depicted sign language or those that show the actual historically documented gesture signs as applied to various materials? If so, why would not these signs have more significant import as to meaning as opposed to subjective speculation? I have previously stated that I am not a diffusionist (a term that seems to be a pejorative appellation in archaeology). ‘Diffusionism’ is not meant or used in a pejorative way at all. There are both, diffusionist and evolutionist models. Their acceptance or refusal really depends on how well they are argued and proven. This is science. Science is not interested in sensivities, science is interested in facts. Basing the idea of a prehistoric global prototype-culture or direct relations between very different and (chronologically / geographically) distant cultures on, at best, superficial similarities of a small sample from a variety and diversity of symbolic expression, is pure speculation. Assuming all those symbols, icons, and signs would bear the same meaning, in historic societies (where written sources help to understand their background) as well as prehistoric cultures (where these additonal sources are, naturally, lacking) is pure speculation. You simply can’t prove this. Sure, I cannot prove the opposite, but in this is of course a case of “Negativa non sunt probanda.”, so the burden of proof has to lie with the other party. Don’t get me wrong. I do not at all deny that there was a symbolic language of sorts in use and that it was important to the early hunters which erected the Göbekli Tepe enclosures. However, I do doubt that there is *one* universal symbolic language which spread around the world, finding its way into different cultures at different places and in different times. This is an idea very much rooted in our modern days. Of course I do understand the emoticon someone from Greenland, South Africa, or Australia sends to me (although the Japanese ones still puzzle me soemtimes) – because we’re living in a globalized world of 7.5 million people where (at least in theory) everyone has access to everyone else and some common basic understanding of a ‘global’ culture exchange has been formed. This can hardly be projected into the past, into prehistoric periods of much smaller and much more isolated groups. To be clear: I did not state the “H”-like symbol is a unity. I simply pointed out the sign in question is much more complex than the analogy suggested. The hunter-gatherer groups were not isolated. Each one had a shaman, and all the good shamans were trained in telepathy. There are detailed records and studies of Aboriginal medicine men’s telepathic skill, but also reports from shamans in South America, and from Siberia. The animals are mostly telepathic, or at least the birds and mammals were documented to be, and shamans were a link in a hunter-gatherer society between humans, who practiced speech, and animals who practiced telepathy instead. Considering their high mobility, and that the whole world, aside from Australia, was a single landmass, one should really be hesitant to use the words ‘isolated’ without good argumentation. They had every reason not be, for the sake of their own survival, so those that did survive surely can be said to have found ways to overcome their supposed isolation, and to gather into a larger society, though much scarcely populated, but still quite interlinked to some extent. The barriers still existed in form of ice sheets, and other natural obstacles, but not so much as you might think on the first glance, without a mu h more detailed analysis. Also, the cosmological dimension to interpreting such symbology has been frequently referred to (here, by Cliff), not to mention Sweatman/Tsikritsis! ii) It does seem rather strange, therefore, and bearing in mind that the discovery of Göbekli Tepe, and the work of the current Project significantly postdates the examples being brought forward as comparisons, that the Project team does not take a more proactive role in assembling multidisciplinary contribution. It may be that I’m mistaken, and that such is being considered, with reference to your response to Tom Lawson, “…We are currently looking into this question in the course of ongoing research.” I was wondering if this is the case, knowing that your colleague, with whom comments have also been exchanged here at Tepe Telegrams, is very if not totally, dismissive? Archaeoastronomy. I also offer this, prior to publication, to respond to your criticism of not being contacted in advance by said authors as mentioned above, regarding the Vulture Stone. Except I’m going further by also doing it publicly here, and therefore at some risk of advanced negative reaction. But then I am not a scholar attached to an academic institution, and tied to protocol attached to academic journal publication, so I’m prepared to take such risks! I have reoriented the images to make it easier to relate the landscape setting to the detail on the stone located at the end of the passage. The quoted dating of the tomb is c. 3300 BC. My archaeoastronomical dating is as in the graphic. I interpreted the symbology as representing Halley’s Comet where both the stone, and the landscape setting, represent a “date stamp” in different ways. I think the calculation is self-explanatory, but more importantly I also refer to Gobekli Tepe in terms of astronomical interpretation. 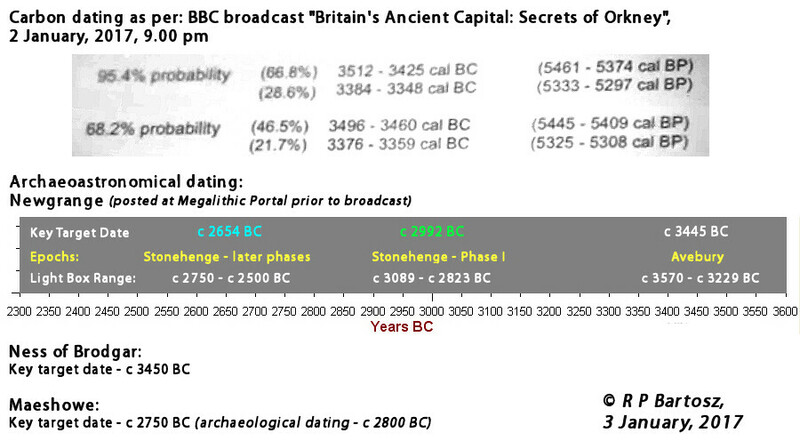 vi) In the graphic below I illustrate the how the same astronomical methodology enables me to date other sites, using the term “Key Target Date”. Equally I show comparison of my method with archaeological dating at other sites. Newgrange is a little different due to the nature of the light box, but it is beyond the scope of this comment to explain further. A particular point is that during this series, the investigating “Team”, included Chris Packham, a well known presenter and naturalist. He pointed at a rosette symbol found at the site, but had no explanations. To the viewer the natural interpretation would be that the rosette had botanical rationale. If the team had an archaeoastronomer or a historian, then like myself, even while he was speaking to the camera, the symbology of the “Royal Game of Ur” would have perhaps come to mind before any botanical implication – and I graduated having studied Botany and Zoology, as a joint honours course! Briefly, it seems to me that your Project, and related comments at The Tepe Telegrams, should address the growing evidence of global and cosmological issues, irrespective of “errors” of detail, which may not equate with errors of interpretation. In short, I suggest that you present the above to an astronomy scholar allied to your academic institution for comment. I have no doubts that an astronomical interpretation will not be dismissed so easily and perhaps of value in discussion with your bio-archaeologist/s, which I understand the Project does have access to. Considering “diffusion”, it is as much a multidisciplinary issue, rather than the narrower “…convincing archaeological or historical evidence…” suggested. Of course, I reserve the right to publish material in the context of the above comments and details as I wish – which I have planned as part of my overall strategy, outside of academic journals – but I reveal this in an honest attempt to encourage wider collaboration by your Project. The words I read at present, across several articles, are not hopeful that this will happen. You are free to contact me at academia(dot)edu at any time. I will be sending a copy of this to Sweatman/Tsikritsis. All the comets have in-built rocket propulsion – they loose mass because they are comets, which affects their trajectory quite significantly. Even few m/s of a change means a lot over time spans of thousands of years. The point is, orbits of all comets are essentially unpredictable on a long term. By that, I mean after just a few revolutions. That is, just a couple of centuries for the Halley comet. Besides, Halley comet has nothing to do with the one that impacted at YD, primarily because the one that then impacted was destroyed by that impact. Shape, composition, behavior and orbit also firmly exclude the comet Halley from being a surviving chunk of the progenitor. 100% confidence on that. That said, it means that comets can not be used for dating in archeoastronomy. 1) I didn’t say I was using comets for dating! Comets are indicated, by interpretation, alongside the “date stamp”, which is not cometary. Having said this, if they are indicated, then they will have had to have been naked-eye comets, otherwise we are probably talking meteor showers. However, there appears little point in “counting” – if this interpretation is correct for the encircled lines – if we are talking meteor showers recurring annually. So the symbology suggests an impressive object returning periodically at regular intervals, but across generations of time. 2) How many naked-eye short-period comets are there? Try Wiki on Halley’s Comet, if readers are not astronomers and don’t have access to scientific papers – it’s pretty accurate! Quote, “”Halley has probably been in its current orbit for 16,000–200,000”. End Quote. Gobekli Tepe is within the lower end of that timescale, never mind Loughcrew. It may have been a long-period comet, hence my note “(unlikely)”. I suggest people investigate where the Orionids’ radiant is, although this can vary, and the Eta Aquarids are also associated with Halley’s comet. 3) Try here for some historical information about recorded sightings: https://ssd.jpl.nasa.gov/?great_comets, which clearly covers a period considerably greater than 200 years. 4) I never said that Halley’s comet had anything to do with YD. 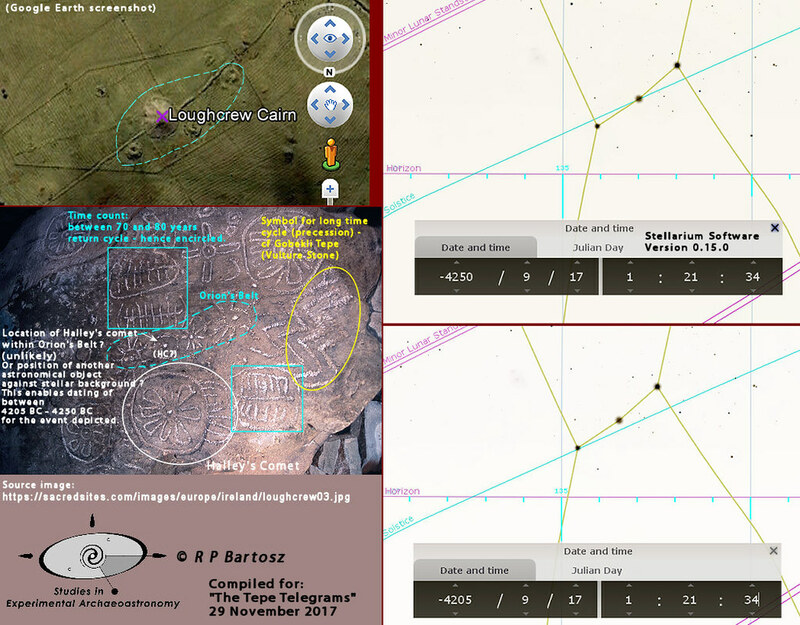 In fact I’ve gone out of my way to make it very clear, elsewhere at Tepe Telegrams, that my interest is the integrity of astronomical interpretation, and that I think any connection with YD is, at best, premature. You should know that as you’ve read my comments elsewhere. It’s unfortunate, although I welcome your response in highlighting cometary issues, but it is otherwise misleading. I am not interested in the YD aspect, sensationalised in the media, and which continues to be linked to apparently any conversation regarding astronomy at Gobekli Tepe. I respectfully ask you to desist from making such links in the future. Yes, of course that comet Halley was there for a long time. The point is, one cannot make accurate predictions for the future, on when and even if it will come up again, not in a long term anyway. Data about the past sightings are the facts, but not periodic, so they cannot be extrapolated long into the past, at least not accurately. One could in principle say that the comet appeared from approximately that direction, but not exactly on what day, month, or even year, depending on how long into the past one tries to extrapolate. GT, among other things that it has recorded, has a detailed records about the events of YD. I agree with you, though, that it is absolutely forlorn activity to talk about it here, in the comments. I reserve my right to do so in the future, however, for the sake of entertaining my freedom of speech. May I remind you though ,that it was you who was viciously defending the Fox paper, which attempted to link the GT with the YD event, and was still doing so in this very comment by saying ‘What Does the Fox Say? And the Fox Cries, “I am Halley’s Comet”…’ , if I am not misinterpreting your words ? That said, I admit that I did not go into details of your argument, nor am I currently interested in other monuments, in Britain, but since I have my (not yet published) opinions on the Fox paper, on GT, and YD, and the links between them, I answered to your comment. You politely asked for the opinions of others, so I respectfully gave you mine. Please be clear in the future when you make such requests that you only wish to hear an applause, not critical remarks. Yes they do appear quite different. What I was trying to say is that if one views them as symbols then one would think their meaning is quite different but if one views them as compounds of signs they may be paraphrasing something quite similar but making fine distinctions. One can find the “H” sign as used in California, Nevada, and Peru. From what I have read diffusion is quite unpopular in archaeological sentiment at the moment. In any event, why not a combination of both diffusion and evolutionist theories or even a third one? “You simply can’t prove this. Sure, I cannot prove the opposite, but in this is of course a case of ‘Negativa non sunt probanda.’, so the burden of proof has to lie with the other party. It seems the burden of proof would be a two way street since both sides claim and dispute. No, no, no – You are really misunderstanding my position in regard to sign language. I do not envision it as spreading from a single common source and seeping out into different cultures. That may have happened originally in a relatively local manner, among small groups, but once a fairly large number of groups had learned the system they then took this knowledge with them (just as they took their hunting expertise, stone tool making, etc) wherever they migrated. Such migrations may have been quite convoluted in their paths and that would add to the difficulty in tracking how sign language moved about the ancient world. We don’t know where or when sign language first came into use, we can only view its use among a variety of ancient cultures. Maintenance of the system would, most likely, have been done fairly locally between groups that were in frequent contact. I have written literally hundreds of translations ( all found on academia.edu and Scribd) derived from a large number of cultures found throughout the ancient world. When I began my research I did not set out to prove that there was a “universal” sign language system. I began simply with a study attempting to discover the underlying organization of the rather odd and rigid imagery found among ancient societies. It was only after severals years that I began to suspect the the imagery was constructed using gesture signs. My study was limited to the Americas for many years and I hardly expected it to apply outside of the “Native American” sphere. Now, forty years, later I find these gesture signs were in wide use globally. Finally, as I have said previously, I have only great respect for archaeology. Without it we would know very little about our human past. I also respect the scientific method and have tried to apply it wherever possible. The only way I can “prove” that there was a widespread ancient depicted signing system is through use of the historically documented signs and applying them to ancient compositions. My understanding of the system is not perfect. There remain areas that are difficult to understand. But the broad picture is one that provides solid hope of adding to our understanding about how our ancient ancestors thought. I made a reply to Casual Visitor’s last posting. Unfortunately it did not appear as “awaiting moderation”, and I thought that I had included too many web links for WordPress – I recall Oliver saying that only a maximum of two is allowed. So I removed them but my comments still don’t appear as “awaiting moderation”. So I’ll leave it for now until either Jens can sort out my post or let me know if indeed, he even has one of the two versions, or both, before I try again. No comment arrived here, sorry. Perhaps there is a character limit? 1) Who’s really interested in day, month, year? I think this aspect is a case of taking it a bit too far. It’s a periodic spectacular naked-eye comet, commanding attention. It’s been around for thousands of years and probably in a very stable orbit. It is connected with an equally “spectacular” constellation (Orion), or asterism (Orion’s belt). You appear to be suggesting “rules” exist about what could be seen by way of comet observation. But equally then, Halley’s comet appears, from the evidence of the historical record, to be an exception to the rule. If it is an exception, and the astronomical facts suggest credibility, then we have a prehistoric record of it’s appearance at Loughcrew and possibly even GT – that’s the implication of what I’m saying, and presenting! (scroll down to section 3.2 and subsequent discussion). At the end of 3.2 they clearly state “The fox symbolism on the central pillar in Figure 2 indicates this pillar is referencing the Taurid complex, possibly the Northern Taurids.”. In section “4.Conclusions” at 4) they say, “The fox symbolism on the central pillar in Figure 2 indicates this pillar is referencing the Taurid complex, possibly the Northern Taurids.But the symbolism on pillar 18 might be consistent with other astronomical interpretations as well that we have not considered.”. I am offering an alternative interpretation for their consideration. Not at all. you presented a case, and I politely presented an alternative view. Your comment is therefore unwarranted and clearly can be interpreted as you not happy with being presented a challenge! This is what constructive discussion is all about, argument and counter argument, if it exists. Readers can then judge as they wish and come to their own preferred conclusion. I welcome your comments. 4) Given that what I am saying is perhaps not so clear, let me present further clarification, as I intend to do when I publish, but the purpose here is that I am consulting in a public forum, for all readers to observe or contribute as they wish. I could have taken the route of uploading a paper at academia(dot)edu and opened a session, inviting attendees to comment. As an experiment, I am treating discussion here as a precursor to that because not all readers here will necessarily be members at said “Academia”. Then, also, there can be no criticism should Jens or Oliver, or anyone else not wish to join the session. Perhaps not protocol, as you, or they know it, but at least others will get a taste of what’s to come, in terms of a proper scientific approach. B) Pillar 31 has no fox symbol on it as far as I am aware. Pillar 18 does on its west side. I ask the question why? My answer is that the two indicate an astronomical phenomenon which appears, and disappears, periodically and is likely to be a comet of notable “spectacle” when it does appear. Clearly, it needs to be a naked-eye phenomenon. 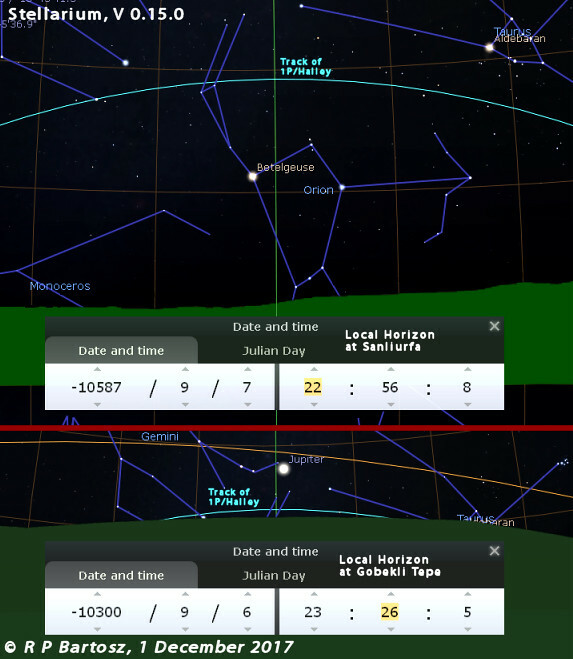 i) The orbital path of Halley’s comet at respective dates. The upper image is centered on Sanliurfa and shows a different aspect on the sky, than that of the lower image, which is centered at GT. The local horizons are generated by software (“Horizon”, Andrew Smith). They may not be entirely accurate, but I suggest accurate enough for the purposes of the illustration. Obviously for accurate determination, this would require a theodolite survey, or GIS software using point data. ii) It is clear that as the orbital path passes through the “crook” of Orion’s “arm”, then it would have been impracticable for the builders to construct an arm on top of the Pillar. So I suggest the answer was to engrave the arm as we see it today. The fox was then placed in the said “crook” to represent the comet’s track, and/or position to look for and observe it. iii) Again it is clear that, as possibly observed from GT, the comet would “graze” at the local horizon. A representation as a fox, with long tail, reflecting the appearance of a distinct naked-eye comet, at the horizon, I would suggest is appropriate symbology. iv) The GT project team#s bio-archaeologist may wish to comment on the historical record of foxes in this locality, and the nature of the evidence of foxes going back to the epoch concerned? v) Since the comet appears periodically, out of the “darkness” of the heaven’s, then it may be that the stone with the hole acts as both as a sightline and “gateway” for the entry of the “fox” between the two central pillars. Hence one pillar without the fox and the other with the fox, indicating a time-lapse between the events to be found when observing the arm of Orion at a predicted time. The alignment, to the east of south (approximately 173-degrees), suggests that the phenomenon was observable close to the horizon at GT, hence the narrow window for its observation as “grazing” on the horizon. This doesn’t mean that it couldn’t be observed from elsewhere, rather, that they chose this depiction and alignment to pinpoint, for future generations, where exactly the object could be observed. In the epoch shown, meteor showers (presumably “Orionids”), would not have been visible because it would have been daytime, and it is not until around 9300 BC that they would have been obvious at around twilight, subsequently becoming more visible as time progressed over the decades and centuries. Of course it does not mean that some “daytime” meteors were not visible. Either way they would also have been “Earthgrazers”, enhancing the “grazing” perception of the respective comet. In short, I’m saying that the astronomical evidence suggests Halley’s comet and the Orionids, as the phenomenon represented in Enclosure D as regards the fox. I have additional evidence, from what I have been able to accumulate. Jens said that he was not in a position to release photographs at present, that’s OK and please don’t take that as me having “a go” at you. It may be that in due course it will be possible to add to the evidence. I’m presenting a multidisciplinary view from my professional background in biological sciences, and landscape matters, coupled to being an amateur astronomer (most of my life) and archaeoastronomer (twelve years to date). I’m open to any comments. Last time when we debated, I gave you credit (and still do), for discovering the Vulture in the stars. I promised a follow-up research on that, and the results of which I delivered, there in the comments on that page. Perhaps you missed it. That is what I have to say about the Fox. Thank you again for the Vulture image. Read the article, it is strong from the start in terms of dates by a long way. If as they say they the Originals , landed up on the North coast then moved around and last to the south of the continent. Only problem is there is a site called Point Richie dated at 80000years old. So the dates don’t stack up. And therefore bring into question this article from the start. Assuming you are referring to the article by Clarkson et al. They produced these dates with the help of a rather new method, optically stimulated luminescence (OSL), dating the last time quartz grains in specific layers, and narrowing error margins with the help of so-called Bayesian statistic. This way they are arriving at an occupation date of 65,000 years ago, with a probability range of 60,000 to 70,000. Solid, double-checked science. The extraordinary old dates for Point Ritchie is, to my knowledge, a preliminary indication based on geological layer formation (calcrete if I remember correctly) above possible culture layers (fireplaces for instance). Jim Bowler (of ‘Mungo Man’ fame), who came up with these dates, emphasized that this stratigraphical and chonological model needs to be validated through sustained research. So, I wouldn’t exactly say that this discredits Clarkson‘s and her colleagues‘ research. Not at all. Yes, the hugely esteemed scientist, Prof Jim Bowler, perhaps Australia’s most respected geochronologist directly examined the Point Richie shell midden and gave it a minimum date at 70,000 years with a preference for an earlier dating closer to 80,000. Have we any reason to doubt that he is correct on his minimum dating? This is perhaps the most capable scientist we have for such a dating an academic known to be conservative and an ardent Out of Africa theorist. It is true that he ’emphasized that this stratigraphical and chronological model needs to be validated through sustained research’ but do you know how much academic research has followed for this incredibly exciting and crucially important site? None. Since the site was examined by Bowler no more mention has been made of it, and no institution has expressed interest in following up. This is horrific! Imagine finding a potentially 30,000-year-old site in New York and no academic felt it worth looking at! Something is very wrong here in Australia, there is a trend for problematic sites being skipped over. We are fortunate that at last the deep dates for the Madjedbebe rock shelter have been confirmed, after decades of the real antiquity of that site being denied. The minimum date is given at 65,000 years, but they also point out they provide a 95% chance of the site being over 70,000 years and that many artefacts produced dates of 80,000 years. When we consider the minimum date for Point Richie (near to Tasmania) at 70,000, this strongly suggests that occupation in the North began at least 80,000 years ago, the deeper end of the Madjedbebe date range. All of these dates are problematic, even at the minimums, because they don’t fit with the existing model in Out of Africa and in the populating of Eurasia. This is really just scratching the surface of a much larger subject for discussion. Thank you for this response to the article published by The Epoch Times. I was initially quite annoyed by this piece as I assumed it was based on having looked at a more significant part of my research, but neglected to mention it, I now understand that it is limited to the information in the Epoch’s article. The article was very light on evidence, though still conveyed some sense of why I had become interested in investigating this topic, so I said it was OK for them to publish it if they liked. First, I must say I do not at this stage believe Australian Aboriginals built Gobekli Tepe. What I will say instead is that there is compelling evidence of a direct connection between the cultures of Arnhem Land (Australia’s north coast) and of the early people in the Near East, especially the builders of Gobekli Tepe. Knowing the intensity of Aboriginal connection to their lands I am doubtful people from Arnhem Land would have wanted to go anywhere else, the belief that soul and ancestral land are bonded together has kept Australian Aboriginals populations on their respective ancestral lands for tens of thousands of years without much signs of movement. So how then can there be such a connection? The most obvious answer is that there was a bridge of sorts between the Near East and Northern Sahul. That bridge would almost certainly be the mariner culture just to the Northwest, one which incorporated the various Indonesian Islands, part of Papua New Guinea and much of Southeast Asia (a region formerly designated as Sunda). We know that the people of Sunda were expert sailors as far back as 40,000 years ago and even long before that, they were using watercraft as the movement of people of people between Sunda and Sahul during the first populating of these regions had to involve crossing the Wallace Line in engineered crafts of some type. This is not a trip made by swimming. I can supply papers on these matters, but for now, common sense should suffice, humans that had watercraft 60,000 years ago would have developed some pretty handy boats/ships by 15,000 years ago. Some of the art in Northern Australia showing ocean-worthy vessels is suggested as being 17,000 years old. Naturally, wooden ships rot, and we won’t find any of these, but that does not mean we can just pretend they did not exist. The people of the Indonesian archipelago have always been dependant on sailing, and the distances between islands are relatively small once you become capable mariners. The next question is, did people of that region build megalithic structures? The answer is that there is evidence of an extensive megalithic culture across Indonesia and Southeast Asia. It is not easy to find well-dated ancient megalithic sites, and I have not yet made contact with academics that are experts on these. I would not expect to see many sites that date back to the Younger Dryas, you only need to look at the extent of the flooding caused by sea level rise during that period to appreciate we can only hope to find such sites under the ocean. Seafaring island cultures are mainly dependant on fishing and trade, meaning they place themselves almost entirely on coastlines. With the sinking of the Sunda plate cane the destruction of virtually all of the oldest habitation sites. Possibly Gunung Padang and Cibedug may be exceptions to this rule, they are yet to be well-dated, but it is not far-fetched to suspect they are 12,000 years old (the famous date of 20,000 years old seems a bit hard to support). Sunda provides a sufficiently ancient populace with a known megalithic culture, with the means to be in contact with both Northern Australia and people living along the coastlines of Asia. They could also have reached anyone that lived along navigable rivers (which most ancient populations tended to cluster around). I am also not the first to hypothesise that the ancient Sundanese mariners might have even founded colonies great distances from their homelands. It is certainly not a difficult to imagine that the well-experienced Sundanese sailors could potentially make contact with people living at the top of two large navigable rivers, the Tigris and the Euphrates. What is required now is additional evidence that this is a real-world scenario rather than just something possible within the technology and cultural reality of the period 15,000 to 12,000 years ago. As said at the start the Epoch Times article was pretty light on details and represents a small snap-shot of the information I made available to them. I will look to supply ore here as time allows if there is sufficient interest. I appreciate there is often a tendency towards knee-jerk reaction and out-of-hand dismissal when such ‘radical’ new ideas are even mentioned. Try to stay grounded in liberal scientific/anthropological thinking. Keep in mind that if you found XVIII engraved in stone anywhere from Africa to England to Armenia it would be immediately assumed we were looking at Roman engravings, despite the distances and despite that each of the individual symbols (X, V and I) have emerged independently across the globe among various cultures. When we see symbols cluster in ways familiar to us from a specific culture in a different region, we should take that much more seriously than when we look at just one symbol overlapping. In this case, I have already found an intriguing number of overlaps, including spirituality, linguistics, material culture and symbolic expression. My question to you is: when you find the remains that old, how do you know that they are from Homo sapiens, and not from Homo erectus, or any other species (Bigfoots, Yetis) that may have derived from it later on ? Homo sapiens evolved in Africa, but the Asian homo erectus had all the opportunities to diverse and develop as well. Besides, as far as I know, the Aborigines of Australia do have a significant portion of gene inter-mixture of some yet-unidentified subspecies of Homo. (Europeans have Neanderthal genes, East-Asians have Denisovans, but there is at least one more such additional to the human gene pool, as mostly evident from Australia. What is your view on that ? Regarding GT, as I discussed elsewhere, it contains legendary stories from all parts of the globe, but so far I only found stories from the Northern hemisphere, from the Ice-Age zone. Nothing yet from the warmer regions. Dating and locating done by archeoastronomy, as I explained on the page about the Fox paper, 2 months ago. On the other hand, the Enclosure D which is the focus here is devoted to Younger Dryas, the start and end of it. What lies in other enclosures remains to be seen. If there were connections with Australia, and stories from them worth remembering, the chances are that they might be present too. … but there are rumors that Smithsonian systematically destroyed all the evidence of giants in North America, dumping all their discovered bones and remains into ocean. This is a serious accusation against a respectable research institution. If you don’t have solid evidence for this statement, I would suggest to refrain from further spreading this. We are not tolerating the use of this comments section for spreading antiscientific conspiracy theories. Each of these species’ skeletons have very distinctive characteristics and are thus of course distinguishable. My apologies for the offensive accusation against Smitsonian. I clearly stated ‘rumors’. I have no evidence of their past doings. Nonetheless, I *do* have solid evidence for the existence of giants in North America. There is even a portrait of one of them there on GT, which is why I mentioned them in the first place. Except for the nose and ears, looks almost human. You have yet to find it though (and many other images). The story about that one (and his name) was preserved in oral poetry. GT is a mnemonic for that one, among many other epic stories. Just so you know I am not rude, I did provide a long detailed response to this message but it was seemingly deleted. I am not one to repeat myself, especially if it would likely not reach you. It was polite and informative but perhaps it broke some rule I am not aware of. OK, thanks. I see that this has happened to other people and therefore is a technical issue with the comment system itself. Just for your awareness, both of my comments showed as pending, so they were submitted, but I suspect it is connected to adding two comments in short succession. Perhaps visitors should try to leave a little time before attempting any additional comments. I guess it is just a sporadic issue rarely affecting anybody, but this might solve it – no system is perfect. For the record, I’ve submitted 3 comments when I posted the one to you, and they went through without problems, so the number of comments is not the issue here. The length of the comments is not an issue either, for there are often some very long ones. I think that the there might be some automatic system that filters the forbidden keywords, marked as offensive. Vocabulary and topic censorship installed to battle with trolls, but that sometimes affects fair posters for the reasons that they are unaware of. If you still have a copy of your answer, I suggest that you try to break it in pieces and try posting them individually, one by one, as simple text without web links or images. If there is a problem of censorship, then some messages would be missing. Oh, yes, having too many web links in a post is considered offensive by the system and such messages are being blocked. Just to be clear, I have not seen any evidence that the ‘Smithsonian systematically destroyed all the evidence of giants in North America, dumping all their discovered bones and remains into ocean’ but I have read some accusations online. I in general agree but nevertheless a genome has migrated over time and distance between the two from Denisova. What is emblazoned on the Wizard of Worgaia body may well be the product of oral history and likewise oral history may have, would have played a role in the symbol on Pillar 28. Over time the symbol may have evolved into an H at GT or vice versa may morphed into a shorthand form as just a horizontal line in Australia. Whimsical as the suggestion may seem I’m not prepared to entirely discard a tenuous possible connection.